Sri Lanka Tourism is partnering top blue chip companies to enter the lucrative 40 billion dollar Cruise line business that is estimated to carry 22.3 million passengers and the market growing at 3.2% in volume. Carnival Corporation is the market leader with a share of 48.1% followed by Royal Caribbean Ltd at 23.1%, Norwegian Cruise Holdings at 10.4% whilst MSC at 5.2%. 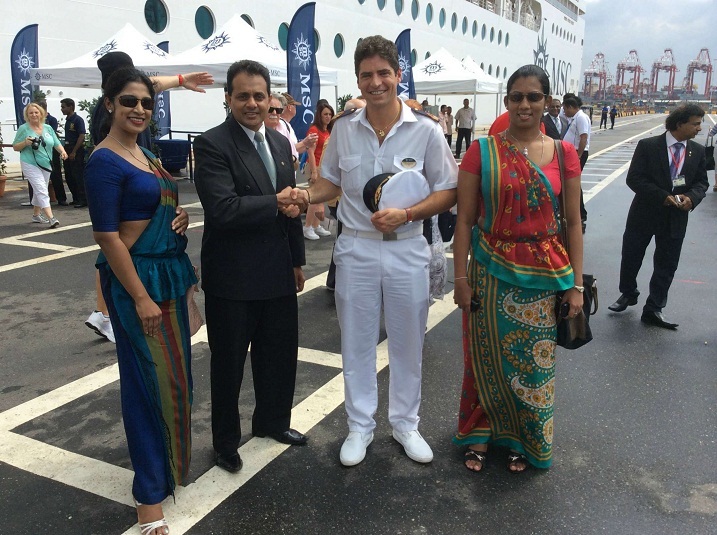 I was delighted to see MSC docking at The Colombo port with almost two thousand passengers commented Chairman Sri Lanka Tourism Promotions Bureau Rohantha Athukorala. Overall Sri Lanka tourism is at a high of 16.7% growth in February and todate registering a 11.6% growth with key markets like China bolstering a 86% growth and India at 14.2 which are the top two markets for Sri Lanka for the year 2015 he said. Normally the average spend among cruise liner travelers was at $214 which is in line with the average spend of a UK traveller (without air fair) in Sri Lanka that attracted MSC to the Colombo Port said chairman Athukorala. Some of the key trends among the cruise liner passengers are digital connectivity when the ship is at high seas whilst catering to the individual dietary requirements is more a industry feature than a individual brand highlight said Athukorala. If we are to be in line with the 40 billion dollar business we must work closely on a solid infrastructure that supports cruise liner visitors like shops close to the docking bay and attractive inbound tours to scenic locations be it wild life, beaches or cultural sites voices Athukorala. Currently the one day excursions are mainly around the city and to Pinnawala. With the launch of the Free range zoo and the ability to see the largest mamals on earth - elephant and whale in one day brings out the key brand attribute Sri Lanka - Compactness, Diversity and Authencity he voiced. of The Asian cruise line business is worth 1.5 million visitors with Carnival Cruise liners aiming at fifty percent share.